Not to be confused with Armitron, a US watch company. 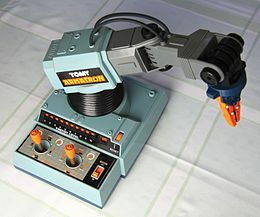 The Armatron was a toy robot made by TOMY and distributed by Radio Shack in the United States since 1984. It consisted of a crane-like arm with two attached joysticks which could be manipulated to pick up small objects. It was essentially similar to industrial robots of the 1980s, though it was strictly user-controlled, with no automation built in. 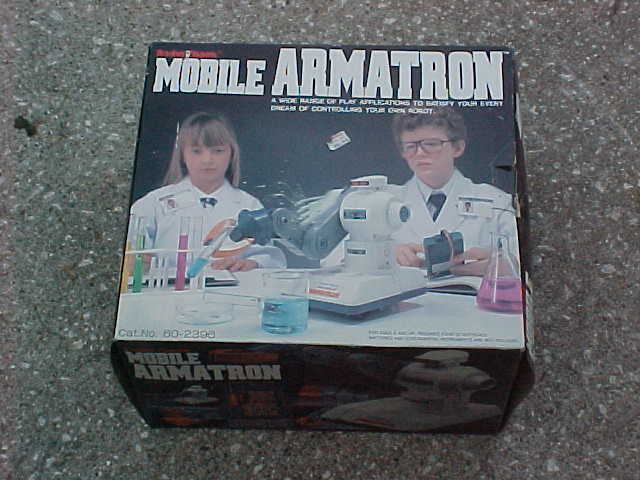 The Armatron existed in both the original fixed version and a mobile version with a wired remote. It included an "energy level" indicator (actually a countdown timer) and a series of objects such as boxes and spheres designed to be manipulated by the arm. Models with alternate decals or coloring were marketed under slightly different names, including the Super Armatron and the Armatron II. The original Radio Shack Armatron also came with a module pack of items the Armatron was able to lift and move. The Module pack consisted of a Flat Module, with 2 cones and 2 globes as well as a "closed module" which also had impressions of the cones and globes on it as a second platform for the objects to be moved to and from. Movement of the arm was almost purely mechanical; the only electronic component was the motor. The two joysticks selectively engaged or disengaged gears on a set of rotating drums to control the arm's movement. ^ Hawkins, William J. (1984-03-01). "What's new in Electronics". Popular Science. 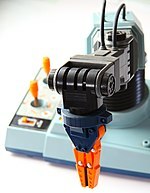 Wikimedia Commons has media related to Armatron. This page was last edited on 10 May 2018, at 18:05 (UTC).